2. In the General tab (default), scroll down to the Signature section (Fig.2). Fig.2. Signature section in the General tab. The Insert this signature before quoted text… option allows you to decide whether the signature should be inserted right below your reply/forward text (option checked) or at the very bottom of the conversation chain (option unchecked). 3. Create or modify the signature. The editor gives you a few basic formatting options such as font face, font size (small, normal, large and huge), hyperlinks, images, alignment etc. To compose more advanced email signatures, use this free email signature generator. Signatures composed within the generator can be easily copied and pasted to the Gmail’s editor. Complete the resulting Edit link dialog and click OK.
4. When you are finished, scroll down to the bottom and click Save Changes (Fig.3). Fig.3. Save Changes button at the bottom of the General tab. NOTE: If in the Gmail message composer you selected Plain text mode (Fig.4), the options in the Signature section (Fig.2) will be: No signature and Plain text (you will not be able to use any text formatting). To use a rich text signature editor as in Fig. 2, click your Inbox to switch to Inbox view, click Compose to open the message composer, click the downward More options arrow in the lower right corner, uncheck Plain text mode, wait a couple of seconds for the changes to be saved and go back to Settings, General, Signature (Fig.2). Fig.4. 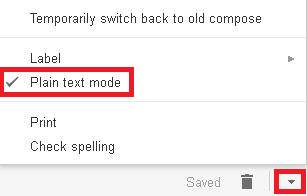 Plain text mode and the More options arrow in the Gmail message composer. After successfully completing the procedure, every new email, reply or forward you compose will already contain your signature in the position you selected in Step 2. For more on Gmail/Google Apps signatures consult this Google Support article. If you need to quickly set up multiple professional email signatures for Google Apps for Business users, make sure to check out CodeTwo Email Signatures. Download the program for free and give it a 30-day test drive. Please provide more details about your email signature setup + are you using Gmail or configuring the signature in the Google Apps admin panel? + are other changes being correctly applied to the signature (if you haven’t checked yet, please do so)? I am having issues inserting an image into my google mail. Using Google Chrome, google mail, PC, Windows 7. The images are 32×32 png images. Tried grabbing images from Chrome and Firefox from the above mentioned sites. Links from one image: https://flic.kr/p/wj3utr or https://mail.google.com/mail/u/0/?tab=wm#inbox/14eb1c109e32b935?projector=1 and I can’t get Photobucket to work, so I can’t provide that link at this time. I am trying to add the hyperlink to my images I have in my signature, but it will only add the link address after the image. How do I make the image hyperlinked to the webpage I need it to go to? never mind!!! Figured it out! I’m trying to do the same thing, but I haven’t figured it out. Help! You have to make sure that ‘Plain text mode’ is disabled. I’ve added information how to disable it at the top of my article. To hyperlink an image, highlight the image by clicking on it (scaling handles will appear around it, as in the above image), and then click the hyperlink button and type/paste the URL you want. I am not sure that I am doing this correctly either. It shows the Facebook icon, but it still shows the url next to the icon. I’m trying to make a hyperlink in my signature on gmail for my business that is on Facebook. I get the message that my signature is too long. Disregard, I guess bringing from Word doesn’t work…. Manually typed in just fine. You can do this by following the steps from my article. In the signature editor (screenshot in Step 3. ), delete the existing phone number and type in the new one. I need to delete an old signature. It keeps defaulting to the outdated information. Hi Erin, Do I understand correctly that, after you modify the signature and click Save changes it reverts back to the old signature? How do I place them next to each other horizontally. For some reason, my icons display vertically. How can I fix this? If your icons are small enough to fit into the signature horizontally and Gmail still messes them up, I don’t think there’s much you can do on this end. Is Gmail part of your company’s email service or is this for personal use? I have a gmail account. The signature includes my telephone #. How to I change it number? Hi Michael, Simply edit your signature as per my article. If you encounter any problems, let me know. The photo of instagram I’m using does not show up. It looks like a question mark, but when I go in the settings it shows up fine. I have inserted social media images on to my signature. To this I want to add hyperlink. As per your tutorial it says to highlight image then click on link and had hyperlink. But this doesn’t work as when i try to highlight image e.g. Facebook it doe not highlight in fact it highlights the whole signature box and the hyperlink then appears as a text at the end of all the images I have added. I have also disabled Plain Text Mode but yet it doesn’t work. Hi Sunil, Are you highlighting the image by clicking on it? i have Facebook, twitter, pinterest, instagram and youtube icons to which i want to add hyperlink. Can you provide the technical specifications of your internet browser and the image you are using? i have taken screen shot and trying to attach to this reply but cannot…. It’s possible that Safari might be the culrpit. Any chance that you could test this on a different browser, e.g. Firefox? Please try uploading the images and adding the links from scratch via Firefox. You would have to upload the screenshots to an external photo sharing service and paste the links here. can I share via dropbox with you??? when i signed into gmail on firefox and clicked on settings I can see the signature but no logo and no icon images of social media…. The last screenshot suggests that Firefox for Mac does not support modern Gmail. Maybe a screenshot of the faulty highlight would shed some light. Hi Sunil, Unless your whole signature is one image, I have no idea what’s going on. If the former is true, correct this by creating a signature with text and separate images. It is one box that I get on Gmail settings and in that I have created the signature with text and images BUT when I try to highlight one image it highlights the whole box and not the image…. I guess to and you given up on assisting us. No worries thank you for all your communications. I had the same problem as you and managed to fix it quickly. Instead of clicking the picture directly, try to click and drag to highlight it (the same way you would highlight text) and then insert the hyperlink while the picture is highlighted. I’m not sure that I am doing this correctly. I am trying to insert a hyperlink into my gmail signature for my business on Facebook. I put in the Icon and clicked the link and added the URL, but the URL still shows up next to the Icon…is this right? Jennifer – No, the hyperlink URL should not be visible. Sunil and Jennifer – I’m not sure what’s causing the issue. Please, try following Adam’s suggestion (https://www.mail-signatures.com/articles/how-to-add-or-change-an-email-signature-in-gmailgoogle-apps/#comment-22130) and report back. I can’t figure out where to change the website hyperlink text in my gmail signature. The problem isn’t with the signature itself, it’s that the hyperlink picks up text from my homepage on my website that doesn’t fit with the image next to it. I’m not sure if this is a website fix or a gmail signature fix. Thanks. When you click the link button, you can set the text which is displayed and the address the link leads to, the hyperlink should never pick up text from your homepage. You can also select the text or image and click the link button then – your selection will lead to the link you choose, then. have just replaced my e-signature successfully. However it is now auto returning to any sender when I open an email to me. Obviously with no content! You might have turned on your auto responder by accident. In the general>settings tab, make sure that at the very bottom your Vacation responder is off. If it is already off or changing the settings does not help, consider contacting Gmail support by clicking the gear icon and selecting Send feedback. I have an email (gmail) account that is for an events coordinator and the previous coordinators name still shows up on emails sent and everyone thinks i am that previous person. I was able to change signature line to my name but cant figure out how to change it on the senders. You can change your sender’s information by going to Settings > Accounts and Import > Send mail as > edit info There, you can change the name which is shown on mail you send. It might also be a good idea to send an email to people from your address book and inform them that there has been a change in personnel. ÈI have created the signature with text and images BUT when I try to highlight one image it highlights the whole box and not the image…. You could try clicking somewhere inside the box and highlight the image using “shift+arrow keys”. If it still does not work it might mean that you either have your entire signature pasted as an image or you experience some strange bug. In both cases, the easiest solution would be to recreate the signature from scratch. You can highlight everything, copy the signature, paste it into (for example) MS Word to make some changes and paste it back into the Gmail signature editor. Alternatively, you can use our free email signature generator.